Barnacle longs for a change in routine. A lone, pale barnacle hangs over the blue water, affixed by its hatlike shell to the bottom of a wooden pier. Here it seems to the barnacle that every day is just about the same: “The tide comes IN. // I am WET and COLD. / The tide goes OUT. // I am DRY and HOT.” The crustacean watches the world go by, or at least as much of it as is visible from one fixed vantage point. Four appendages wave expressively below an exaggeratedly cartoonish face. Its expression is scowling and grumpy: “I am BORED.” When a yellow, polka-dot fish swims by, Barnacle is struck by a thought: “I bet his days are so FUN.” Perceptive readers may notice that from this point Barnacle is actually not entirely bored, as the many delights available to this brightly colored fish play out—at least in Barnacle’s imagination. 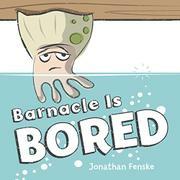 Barnacle pictures the sunny, big-eyed fish happily engaged in entertaining, alliterative activities in the pale blue sea: “I bet he DIVES with dolphins. / I bet he SOARS with sailfish.” But a reversal in fortune demonstrates that excitement and boredom are all in how a situation is perceived (and also that, as in most of nature, eating or being eaten is the rule). Fenske’s open, flat-colored, loose-lined, animated cartoon style and simple dialogue-bubble text in a large, bold font are inviting for new readers.